Dennis is a graduate of the University of Newcastle upon Tyne, where he undertook an intercalated BSc in Physiology, gaining a First, MBBS, gaining first class honours, and subsequently an MD. After a fleeting interest in cardiology and metabolic medicine he finally settled on respiratory medicine. After a senior lectureship in respiratory medicine at Nottingham University he was appointed to the David Davies Chair of Respiratory and Communicable Diseases, which he held for just over twenty years. In addition to respiratory and general medical clinical commitment he was responsible for setting up a Cystic Fibrosis (CF) Clinic for adults in Wales, a nurse and GP based community service for COPD with the objective of supporting vulnerable patients in their own homes. In parallel a primary care nursing diploma and certificate course was set up and over 1500 nurses attended the courses, which are still being run. 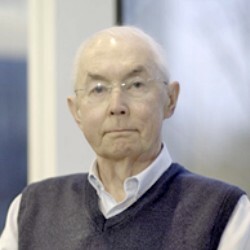 Prof. Dennis Shale was working in GSK as a global medical expert and unfortunately past away in 2017.